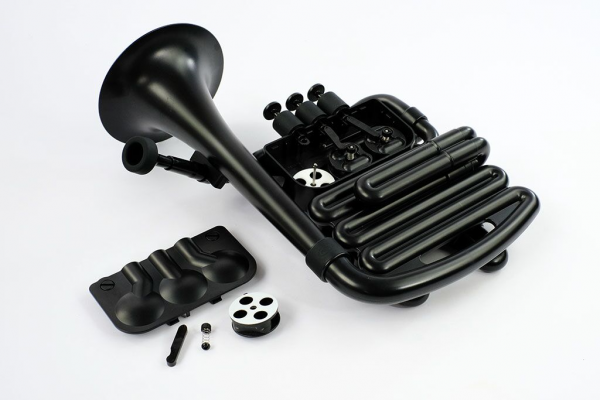 Nuvo’s first “brass” instrument was created with some clear design objectives in mind. Like all Nuvo instruments, the primary objective was that it should be suitable for beginners in the Elementary/Junior classroom. The instrument would have to perform at a level that inspires young beginners while also providing a fun practice environment for amateur brass players. For the classroom it needed to be practical – lightweight, durable and easy to maintain. 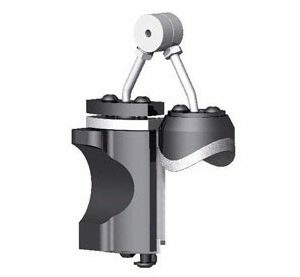 Nuvo also wanted to eliminate valve oil – valve oil and kids don’t mix! 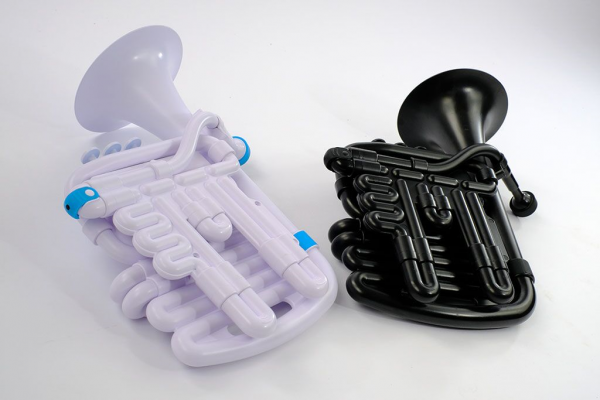 It should also provide the opportunity for kids to explore different mouthpiece options to see whether they prefer low, middle or high brass. 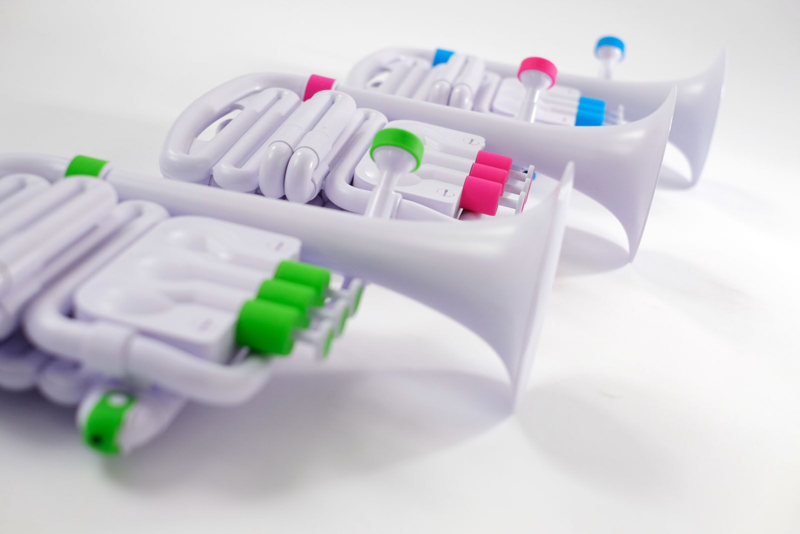 DESIGN: Nuvo are passionate about improving instrument design. The Nuvo design process starts by taking a fresh look at the form, mechanisms and materials commonly found in traditional instruments, many of which have their design roots in the 1800s. Our instruments respectfully preserve the musicality of traditional instruments while adding modern innovations that make learning more effective, especially for children. Due to small parts, not suitable for children under 36 months. 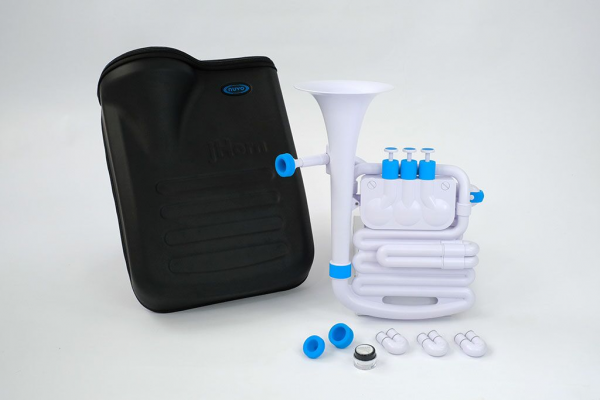 Suitable – Our instruments are ergonomically suitable for all ages. They are lightweight and easy to handle. Tuneful – Our instruments are designed to make note production easy for beginners but the quality of the tone is not compromised. 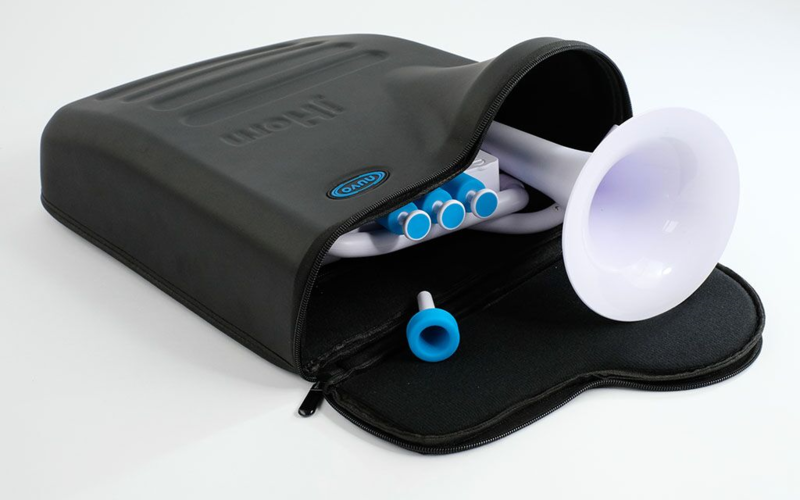 Durable – Our instruments can withstand extreme use making them particularly suited to the classroom. It is safe to keep them assembled and out on a desk stand or wall hanger, which encourages more frequent practice. 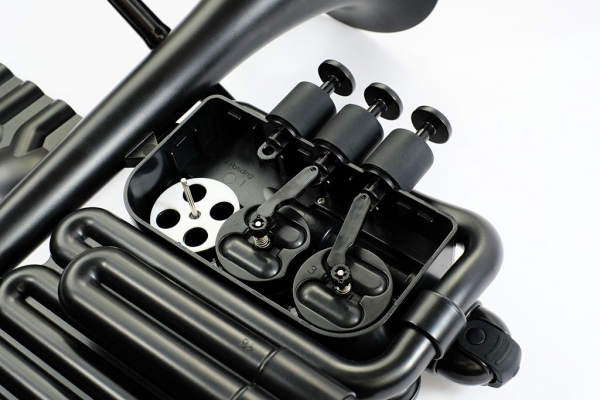 Personal – Our instruments can be customised. We provide a choice of colors, styles and special editions. 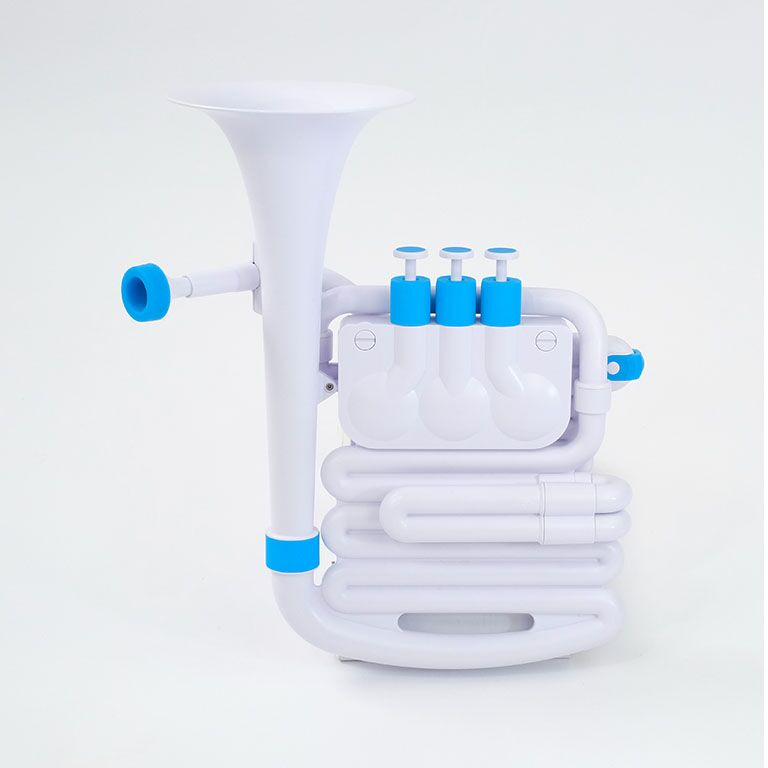 Practical – Our instruments are easy to carry around, assemble and clean. The materials used are 100% washable in warm soapy water! They are easily maintained. 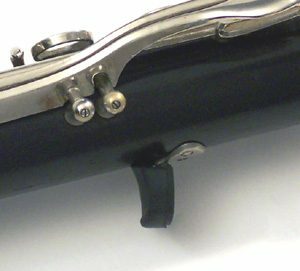 SKU: NU-N610JHWBL Categories: jHORN, Nuvo Instruments, Orchestral Woodwind & Brass Tags: jHORN, Nuvo, plastic brass, plastic horn Brands: Nuvo.